The skies shouted it to the seas that thundered it to the waves that roared it to the great white whales that sang it to the starfish in the deep. And tiny sandpipers danced it on shining sands… “It’s time! It’s time!” On one quiet night, creation whispered a secret. Grass and bees, robins and trees all spread the word. Sheep told their young while angels sang the song to the shepherds. Hushed news of a miracle echoed to the ends of the earth. The moment had come. The long-awaited child had arrived! Creation cried out in celebration, but only a few people heard. Only a few joined nature’s chorus, a song in praise of the newborn King. 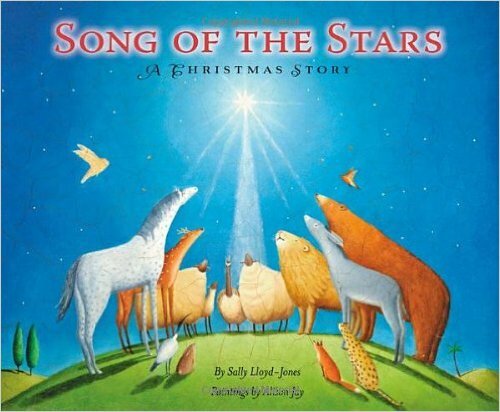 Song of the Stars: A Christmas Story by Sally Lloyd-Jones is a wonderful book! Song of the Stars is about the coming of Jesus and how all the animals and every creation awaits his arrival with anticipation and celebration upon his birth. I love how Sally Lloyd-Jones takes Jesus' arrival one step further and helps us to imagine how deeply creation longed for a savior. The illustrations are beautiful and portray the words on the page perfectly. This is a wonderful book to read to children and my children absolutely loved this book! You can find Song of the Stars: A Christmas Story on Amazon, Barnes and Noble and other bookstores.